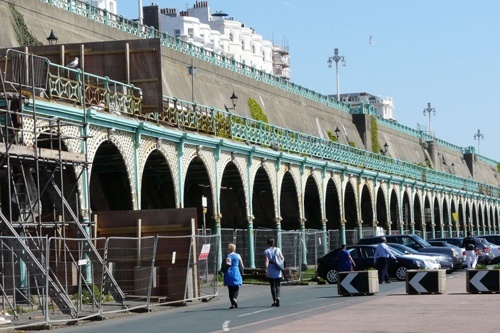 Help restore the Victorian Madeira Terrace on Brighton & Hove seafront by pledging your support. VisitBrighton, the city’s tourism unit, has set up a crowdfunding platform so that everyone can take part. Crowdfunding is a modern twist on the traditional way Victorian public buildings were funded in the first place. A recent family fun day on the seafront raised more than £1,400 through bucket collections, sales of merchandise and online pledges. To make a pledge and find out more go to: www.savemadeiraterrace.org. Residents, visitors and businesses have registered over 700 pledges so far. More are needed. The campaign has an ambitious target of £431,000 by the end of November. This will kick start the regeneration of Madeira Terrace and be used to bring at least three of the arches back into use. You can also pledge your support by cheque (made payable to Brighton & Hove City Council) c/o VisitBrighton Marketing, 1st Floor Brighton Town Hall, BN1 1JA or donate cash at the Brighton Centre ticket office. Commenting on the campaign so far, head of VisitBrighton Howard Barden said: “Just over a third of the total is now pledged, thanks to people’s generosity. Restoring the whole of Madeira Terrace will cost an estimated £24 million, and these initial funds will help attract investment. With your help we can reach the target – whether £10 or £10,000 – every pledge counts”.